Switchfoot has posted a new YouTube video featuring Chad Butler and Drew Shirley urging you to bring canned goods to the shows this month – with their typical humorous twist. ^Be sure to get on that if you're going to a show this fall, friends! 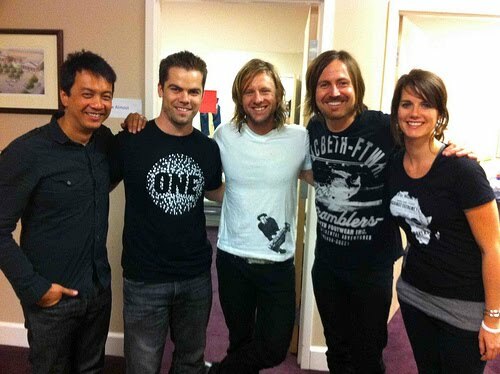 Along the same philanthropic lines, Switchfoot was joined by ONE.org over the weekend at Liberty University. Switchfoot, long time ONE supporters, put on a great show. Our volunteers helped sign up new ONE members to take action around our current campaign: ensuring that babies are born HIV-free. Every day, 1,000 new born babies are born with HIV -– something entirely preventable with smart medicines and smart policy. That’s why it was so exciting for me to be part of this moment where Liberty students and others could add their voice to the movement. To read Jon Foreman's quote, as well as to view the source blog, check it out here. For Christian aficionados, Switchfoot will be featured alongside many popular CCM bands in the latest Wow Hits collection, called "Wow Hits 2011." I wish they could've come up with a more creative title. Anyhow, "Your Love Is a Song" is the track of choice for it's success on Christian radio throughout the past year. To see the full tracklist, click here. ^poor camera audio quality notwithstanding, I'm definitely digging the energy behind the song. It's got a slow-burn rocker type of quality, similar to "Lonely Nation" and even recalls Green Day's "Boulevard of Broken Dreams" to a certain extent. What do you think of the song? 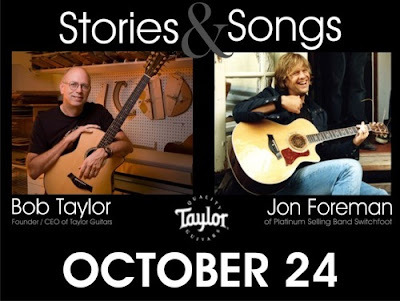 In case you missed it yesterday, Taylor Guitars announced a special "Stories and Songs" event with Bob Taylor (founder of Taylor) and Jon. Here's the press release with all the info. If you can, be sure to head out!